IT WAS A TOUGH CALL but Ross Carter did it. The London International Wine Trade Fair out at ExCel in London’s Docklands was like a beached whale – flapping intermittently, gasping but essentially dying, beyond rescue. Something needed to happen. Someone needed to grasp the nettle. Ross Carter had worked on the show beforehand, selling stand space. He had gone to New Zealand for two years to get his hands dirty in vineyards (do they do dirt in squeaky clean New Zealand?). He worked in the vineyard at Pegasus Bay in Waipara, North Canterbury and then at Mudbrick (promotion: winery and vineyard) on Waiheke Island at the top of North Island. Then he came back and got a job at PLB, initially in quality assurance and buying. Then the opportunity arose. James Murray, who had hitherto been running the ‘international’ wine fair for organiser Brintex, fell on his sword. A corkscrew is maybe more appropriate. The decision to take the show from the much-loved, but often very sweaty and cramped Olympia, to the purpose-built ExCel, had been controversial. Sure enough, many sommeliers and others in the on-trade found it too far to travel between service. Efforts to build the spirits element floundered as the big guns such as Diageo and Pernod Ricard weren’t tempted. Why go to all that expense, buying/building a stand, dragging people off the road and out of the office, when you can just build a website for Smirnoff or Absolut at the office and get people to visit that? As the UK wine sector floundered under the cosh of the multiple retailers demanding discounts, plus the economic downturn, so did the London International Wine Fair. Murray and his team huffed and puffed but there was no way this floundering whale in Docklands was going to be refloated and resuscitated. The call went out: ‘Get Carter’ (or words to that effect. Excuse me for using the title of an old Michael Caine film). The brief was simple: Back to basics. Back to Olympia. At its pomp, LIWF in 2008 as the economic downturn started to bite, was spread over approximately 23,000sq m, had 16,500 visitors and 1,000 exhibitors, of which 88 were UK-based. Last year, back at Olympia, Carter says the 17,500sq m show had 14,000 visitors, including exhibitor personnel, but most importantly, of the 650 exhibitors, 150 were UK-based. So who is this man? Well the 38-year-old is married with a 14-month-old baby boy, Albie, and lives in south Oxfordshire, near Henley. 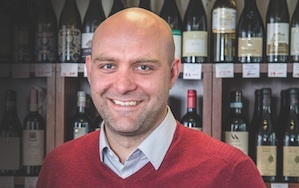 He studied modern languages at University of London and is keen for it to be noted that he recently got his WSET Diploma. Quite right too. He is fluent in Spanish and French as he only returned to the UK when he was 18. His parents moved to Spain– Majorca actually – in the early 1970s to redevelop a finca, a Spanish estate, with a view to providing a holiday home and running courses. When he was 16, they moved to France and young Carter went to school in Bordeaux. Ah, now we’re getting warm.